Now with an ultra-comfortable suspension seat! 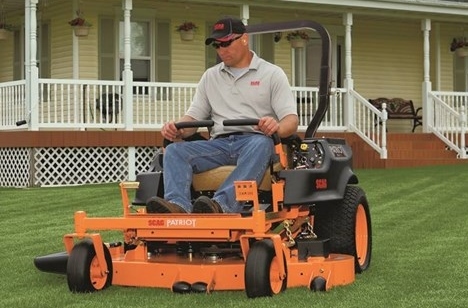 This impressive zero-turn rider is designed with the needs of lawn care pros in mind. Delivering commercial-grade results at an incredible value, the Patriot will exceed your expectations and have your “competition” talking. The Patriot is equipped with a productive 61” cutter deck to leave behind a beautiful quality-of-cut. Its strong hydro drive system brings the power and keeps you moving at ground speeds of up to 10 mph, while larger front caster tires and extra-large drive tires provide dependable traction, stability and a smooth ride. -61” cutter deck with anti-scalp rollers provides a beautiful quality of cut. -Ground speeds up to 10 mph for maximum productivity. -Hydro-Gear ZT3400 (SPZ61) or ZT3100 (SPZ52) hydro transaxles (2 independent units with charge pumps and all-metal gears) deliver smooth drive power while spin-on oil filters provide easy maintenance. 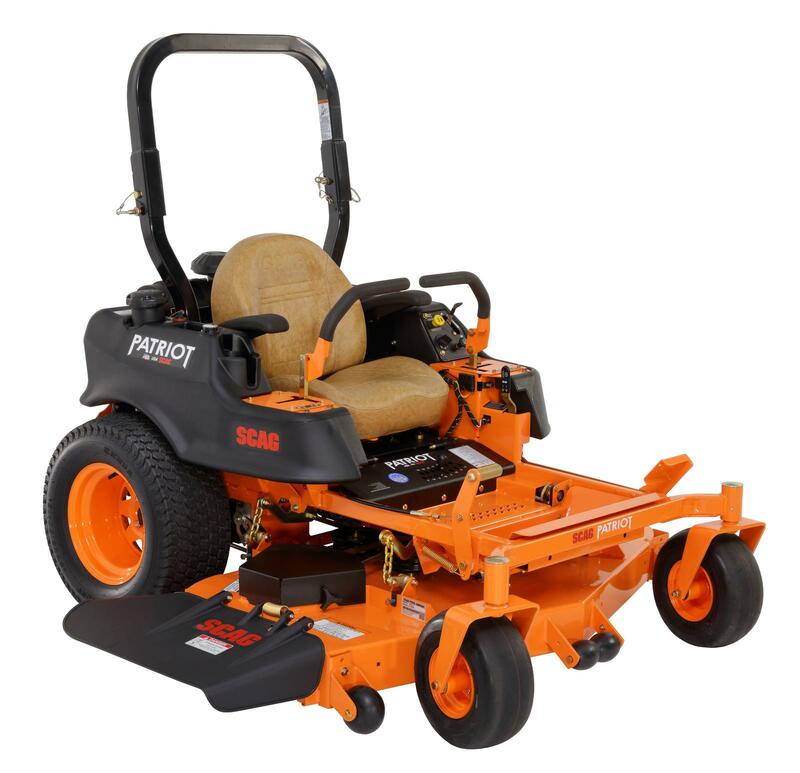 -Low-maintenance mower design greatly reduces grease points for operator convenience. -Rubber iso-mounted footplate for increased operator comfort. Non-slip design allows debris to fall through. -6.5-gallon fuel capacity maximizes refueling intervals to save time and get the job done fast. -Digital hour meter features pre-programmed maintenance reminders. -Convenient operator station puts controls within reach. -Innovative height-of-cut adjustment is quick, and conveniently adjusts in .25” increments. Cutting heights of 1.5” to 5”. -Large drive tires deliver superior traction and a smooth ride. 23” tires. -3 x 6.5 x 6 front caster tires ensure stability and a soft footprint. -Extra-low center of gravity for maximum stability over challenging terrain. -Foldable ROPS allows for easy transport and storage. -Foot-operated parking brake activates a disc brake system for reliable holding power. -2-Year Commercial or 3-Year / 500-Hour Non-Commercial Warranty. See the Scag Limited Warranty Statement for complete details.